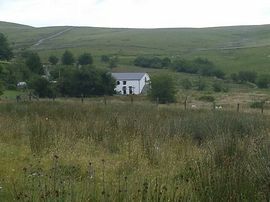 Beili Helyg is an 18th century stone built farm house. 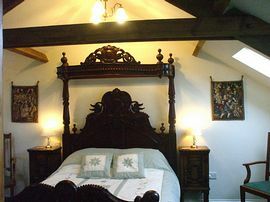 We have recently renovated the attached barns and can offer you wonderfully spacious 4* en-suite guest rooms with beautifully restored antique furniture. There are spectacular views in every direction of the open mountainside of the Brecon Beacons National Park. Rooms have separate access so you are free to come and go as you please. We have 16 acres of woodland and upland meadow with several acres of site of special scientific interest (SSSI) crossed by small streams. As guests you are welcome to stroll anywhere in the grounds. We are in the central section of the Brecon Beacons National Park at the head of the Cwm Cadlan valley. There is excellent walking or cycling from the door; the open access land is five minutes walk. 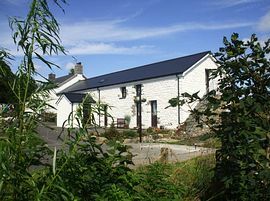 Beili Helyg is ideal for walking with major walks and more unknown routes nearby. We have a boot room and drying facilities, secure cycle lock up and can also provide you with a packed lunch and evening meal. Our home and garden produce is on the menu daily, and other foods are sourced locally with minimal packaging. What photographs can't show is the fresh mountain air, the complete peace and quiet, the uninterrupted long views in all directions and the complete freedom of being so far away from the madding crowd. The sight of the milky way on a clear night is wonderful as our light pollution is minimal. Caving, cycling, sailing, canoeing, wild swimming, climbing, bird watching, horse riding and numerous other outdoor activities are available nearby and fishing is available at rivers and reservoirs for coarse, game and wild trout. For those interested in geology and the landscape this is a rich limestone area with shake holes, swallow holes, waterfalls, limestone pavements, caves and evidence of the Dinas fault. There are many historic and prehistoric sites; Sarn Helen the Roman road from Neath to Brecon, and standing stones Maen Madoc and Maen Llia. We also have visitors who have come to investigate their ancestry as the Mormon Church at Merthyr Tydfil keeps a multitude of records. 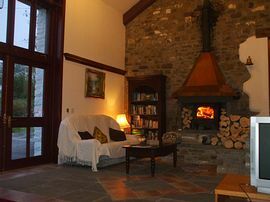 Relaxing and general lethargy are also recommended; imagine sitting with a novel and a drink with your toes in front of a log fire, or on a warmer day sit out on one of our benches in the woods. What a perfect place to come and relax and unwind the stresses of the working week! 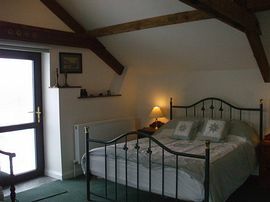 The accommodation, warm welcome and beautiful countryside really exceeded our expectations. Thank you so much for all your help planning routes, cake to keep us going and advice on where to eat. We look forward to seeing you both again soon. M+P, Dorset. Its hard to find such a peaceful place, I think now we have found it! The views are fantastic and your hospitality has been exceptional. Hope to see you soon S+J, Kent. From M4 J32, follow A470 north towards Merthyr Tydfil and Brecon. At Llwyn Onn, take left hand turn following road marked Cwm Cadlan, over reservoir dam, and around perimeter of reservoir. Take left hand turn about half way around again following Cwm Cadlan sign, uphill through forestry. Cross two cattle grids, we are first farm on left after the second. Further directions and a map are on our link above.